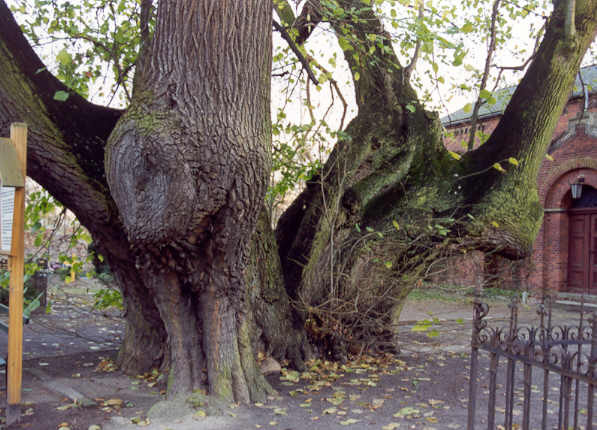 In Germany, in a village very near the Dutch border called Heede, this huge Lime-tree can be found. In Germany there is an age-old Christian tradition of planting Lime-trees in the villages, often near the church. In this case the tree stood on the courtyard of a stronghold wich was build in 1467. 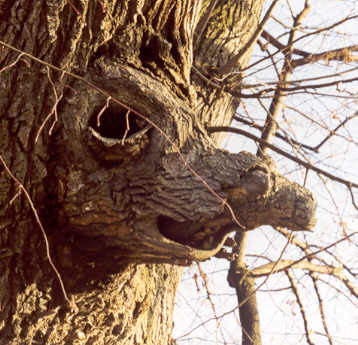 It is thought that the tree is centuries older, so the stonghold was build aside and around the tree. 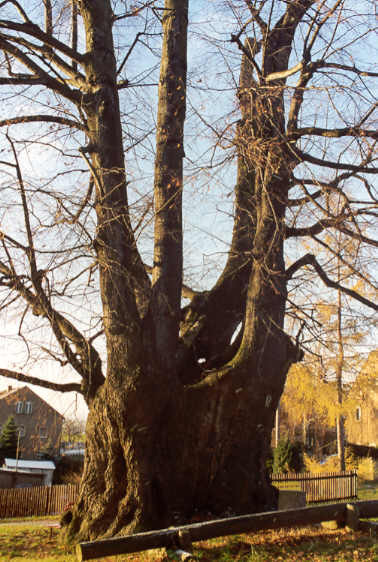 This Broad-Leaved Lime (Tilia platyphyllos) is the biggest in circumference in Germany as well as in all of Europe: the short trunk is 14,2 metre ( over 46 feet) in girth near the earth and is even wider at breast-height: 17,3 m ( 57 feet) ! Between 2 and 3 metres height the trunk divides in 13 big branches. The Heede Lime was damaged during a war in 1677. After that the present-day branches grew out of the trunk and developped the enormous crown wich spreads 35 metres (115 feet). The trunk itself is thought to be about 900 or 1000 years old. See also the Lime-page. Nearly as big but to my opinion even more impressive is the Emperor "Lothar"-Lime in the small town of K�nigslutter, near Braunschweig. 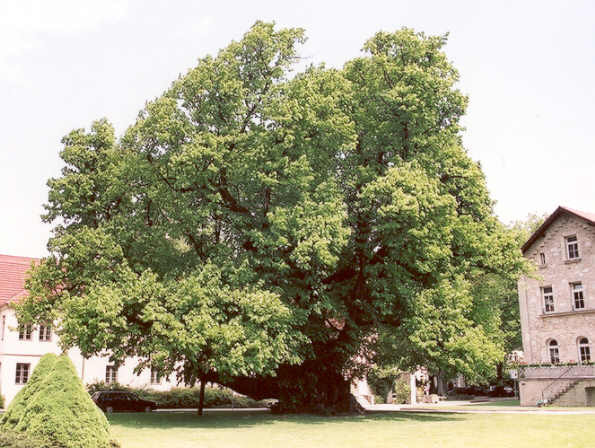 It is also a Broad-leaved Lime (Tilia platyphyllos) and stands at a beautiful open place in a former Benedictin monastery, beside a impressive Roman cathedral. The Lime seems to have been planted by Emperor Lothar III, around 1130, when he ordered the building of the Cathedral as well. This Lime belongs to the most impressive trees of Germany because of its great trunk, tremendous branches and harmonious great dome. The trunk is hollow but makes a relatively closed and rather sound impression. Measured below the huge branches its girth is 11,7m, over 38 feet. Three of the branches heavily hang over like ship-bows. Like the Lime of Heede it is a Large-leaved Lime. In the village Brielow, near Brandenburg, not far to the west of Berlin, this as well enthralling Lime stands near a church on the cemetery. It has a strange form , having two stems bending from each other, looking like two bowes of a ship. To prevent the stems to break apart in 1882 the village-blacksmith fitted a big chain around the parts to keep them together. In the 30-years-war a Swedish high officer fell and was buried by his bride, a Swedish Countess, under the Lime-tree. Near the ground the tree has a girth of 11,3 m; its age is estimated to be about 500 years. 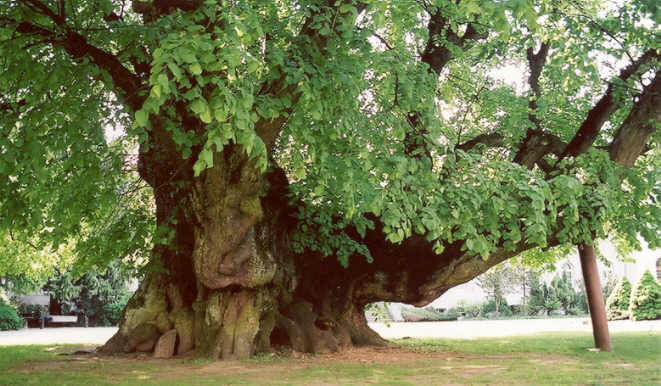 Also in the former GDR, to the south of Dresden, the great Lime-tree of Schmorsdorf can be found. The hollow trunk has a circumference of 10,5 m (34� feet). The tree has the reputation to be about 800 years old. In 1883 a large part of the crown was destroyed by a violent storm , as still can be seen in an old minute-book, owned by Mr. and Mrs. L�we, living in the house on the left of the picture. New shouts developped to the big branches on the left on the picture. The branches on the right are remnants of the older crown. During a fatal thunderstorm on 7 june 1957 a large horizontal branch was teared off and a young boy out of the village was deadly struck by lightning. Since then the stump pulls a malicious face.